But before you rush for the door - they're currently only being tested in Norway. There has been a huge demand for vegan fast food in the UK already in 2019 - ask anyone who's tried to find a vegan sausage roll in Greggs after lunchtime. But some vegans are unsure about McDonald's attempting to introduce vegan products into its menu. "It's great that veganism is going more mainstream and it's becoming more accessible to people," 26-year-old Sarah King, a vegan blogger from Bristol, tells Radio 1 Newsbeat. "But on the other hand, McDonald's is still not an ethical company to support. There are other factors at play, not just the ingredients that go into the food." Sarah says many vegans have concerns about companies like McDonald's paying a fair wage to workers and the environmental impact of its food production. We're asking McDonald's for a response to that. She says she'd be unlikely to try vegan food from McDonald's, but adds she could be tempted after a few drinks on a night out. "I never say never," she adds. But for 29-year-old vegan Dane Cobain, who lives in High Wycombe, having more fast food options in high street chains would improve his options when he's out with mates. "There have been times when my friends have wanted to go to McDonald's and there hasn't been much for me to choose from," he says. Dane has previously eaten items from the menu which, while not strictly vegan because of how they are cooked, include no animal products if he asked for things like mayonnaise to be left out. "It's nice to show people you can be a vegan and still go to places like that without changing your habits too much." "I think as well, for myself and for a lot of other vegans, we see these things as little victories and signs that the movement is growing." The product has been described as a 'trial' but McDonald's Norway tells Newsbeat there are currently no plans to bring the vegan nuggets to other parts of the world and that they are part of a new vegetarian menu introduced in the country. 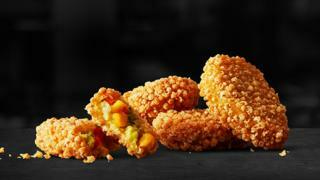 Additionally, and here's the big twist, Norwegian branches of McDonalds are currently deep-frying these 'vegan' nuggets in the same oil as their chilli cheese tops. That would obviously have to change if they wanted to take a vegan range mainstream. But vegan food on the high street is still controversial to some. When Greggs introduced a vegan option to their menu, many people were outraged by the thought of people enjoying a meat-free snack. But demand for their vegan sausage roll has been credited with helping Greggs sales surge by 9.6% in the first seven weeks of 2019.